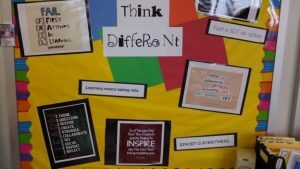 My theme for this school year was THINK Different. I borrowed the slogan from the 1997 Apple, Inc. ad campaign, and used it to transfer my internship experience at Ply Gem to my third-grade classroom. I think differently now, because of my internship through the Kenan Fellows Program, and I wanted to bring innovative thinking to my students. My mentor, Ply Gem’s Innovation Officer Lee Clark-Sellers, is a model of what it means to think differently. Lee thinks in “what ifs” all of the time. She is constantly questioning and connecting dots to create unique outcomes. I enjoyed being in an environment where there is no “status quo”, no hierarchy of titles, and failure is seen as a good thing. My internship allowed me to experience the many facets of innovation — from early ideas to market launch. It has become an integrated part of all that I teach. I challenge my students to work hard to learn and make mistakes. I challenge my colleagues to make mistakes and try new things so we can push innovation to be a main part of education. Resilience, perseverance, and grit need to be base platforms for learning — struggle, mistakes, and failure are right there too. The “right” answer is not the goal, it’s all the wrong answers along the way that will build a child’s learning. I wanted my classroom to be a space where students could work together, or alone. Where they could create with paper and pencil, crayons, or iPads. Where any kind of project is acceptable, if they meet the class-created rubric. But, my classroom also had to be the place where math and reading and science took place. Luckily, our Tech teacher transformed the old traditional computer lab into the iLab, an innovative space for student collaboration. I scheduled the iLab for an hour on Tuesday mornings. We were studying the human body, so I decided to set up the Genius Hour as a project about the skeletal and/or muscular system. I provided a variety of types of projects and let the kids chose their partners. Did it work? YES. Did the kids learn something? YES. Did they have fun? YES. Did it meet my expectations? YES and a little no because there is always room for improvement. One group of students chose to research how the body moves and bends when doing gymnastics. They created a poster to highlight the main facts. Then, they did a gymnastics demonstration in the iLab. Another pair of students wrote a skit about bones. I was thrilled at the cooperation and learning that went on. There were some students who were not as successful. They needed more guidance to help them understand how to think and create their own learning. The goal was to build consensus among the students so they could trust me, each other and themselves. Am I a different kind of teacher after my Kenan fellowship? Not really. I have always included STEM and the 4Cs (critical thinking, communication, collaboration, and creativity) in my classroom. But now I teach with the knowledge that I am not alone. I have 40 other educators in my 2015-16 cohort of Kenan Fellows who are trying new things every day to reach just one more student. The Kenan Fellows Program Network is powerful. My wish would be that every educator could have this experience to know that we need to change our thinking and teaching. And when we change, we are not alone. We have our network of Kenan Fellows to support us. Janet Pride, a 2015-16 Kenan Fellow, teaches third-grade at Washington Magnet Elementary School in the Wake County Public School System. Her fellowship was supported by Ply Gem.